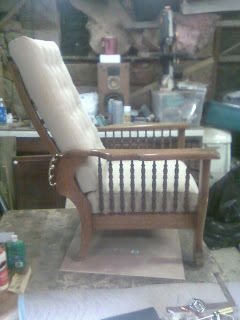 Here are a few photos of the Morris chair I wrote about in previous entries. If you click on the "Morris" link in the Labels Column to the right you can see the previous entries on the restoration process. 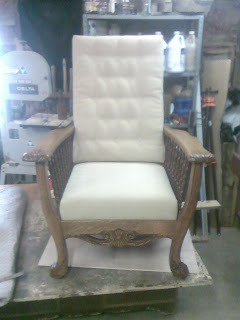 the chair has diamond tufting on the back cushion in keeping with the style of cushion for these chairs.Below are the photos of the chair with the cushions. 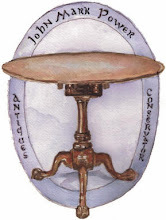 The history of this pedestal table was discussed in an earlier post. 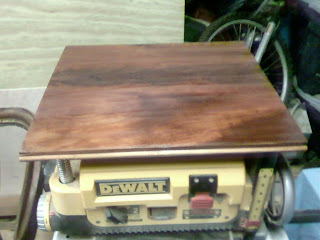 The main problems it has are loose veneer and some damage to the finish of the top. Because of the extent of the damage the finish had to be removed on the top. 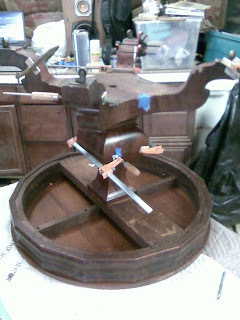 The finish on the base will be restored. Below are some photos of the removal of the finish and the repair to the veneer of the base. The table as it came to me. 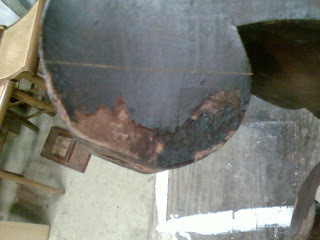 The white marks are rings which have eaten through the finish. 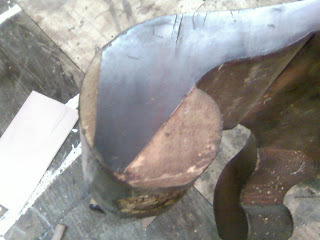 The removal of the finish from the top. 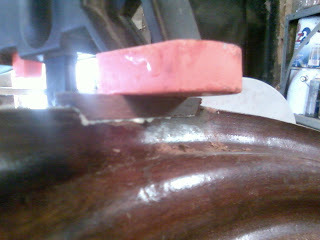 The base has been masked off to prevent damage to the finish. 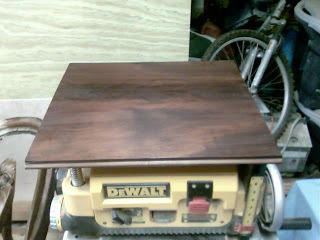 The table wit the finish removed. The light color is mostly due to the angle of the photo. 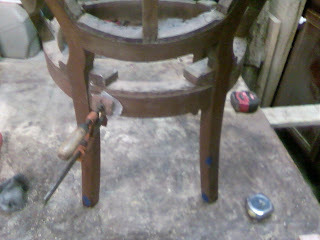 Repairs to the veneer on the base. In a previous post I detailed the history of these pieces. 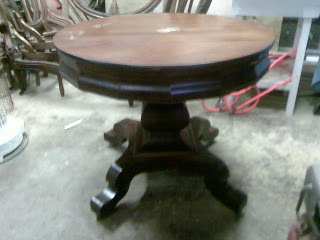 This "Pillar and Scroll" table has severe damage due to a moving accident as well as veneer missing from age. The reason veneer loosens with age is that the veneer wood moves due to moisture at a different rate than the secondary wood it is glued to. in addition, the grain is often going in different directions so that the veneer pops off as the glue gives way. In this instance, the veneer was asked to bend around a foot that caused stress on the veneer and as the glue gave up the veneer chipped off. Below are several photos of the veneer damage and its repair. once the veneer is patched then the patches will be toned and blended to match the existing veneer. 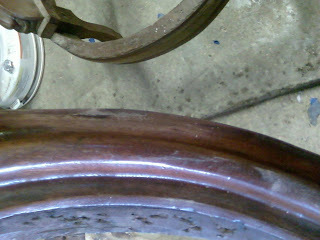 The photos following the veneer patches are of the top after the gouges had been repaired and sanded. 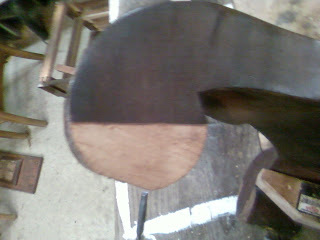 The veneer damage. Everything under the scribed line will be patched. 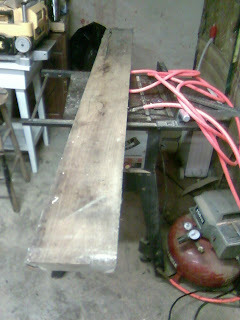 The secondary wood cleaned and ready for the patch. The Veneer patch. 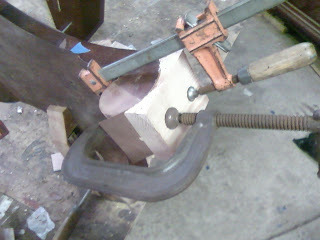 After it has been glued it will be trimmed to the shape of the scroll foot. More veneer damage. The areas of this damage ready to be patched. The veneer patches after the gluing process. Gluing veneer patches in place. 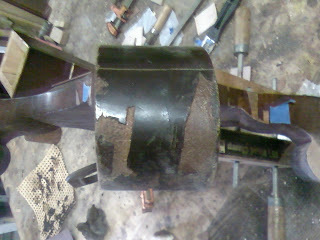 The Damage to the curved section of a scroll foot. 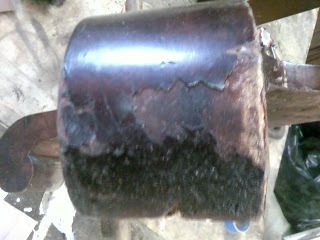 Another scroll foot with veneer damage. Again, everything below the scribed line will be patched. 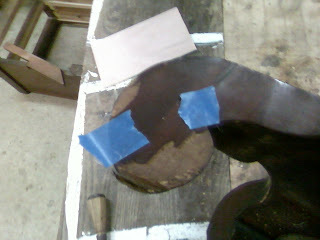 Patching a scroll foot. 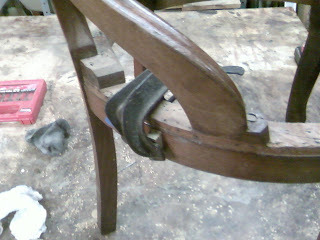 The top after it has been repaired of the gouges and sanded. The natural color was a bit lighter then the leaves. 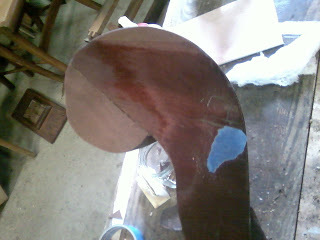 The leaves after they have been repaired and sanded The top stained to match the leaves. 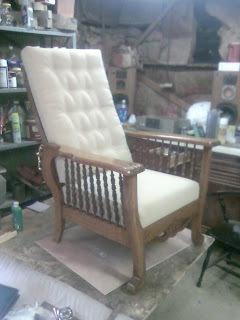 The top and the leaves ready for finish. 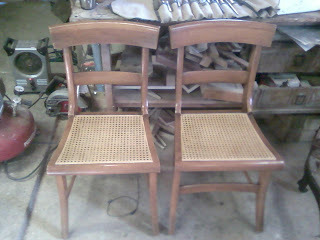 I received two tables which I have started working on. Both are of the Pillar and Scroll style. 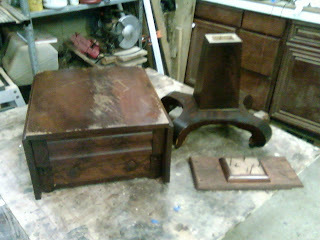 The first is a two drawer drop leaf stand and the second is a pedestal table. I thought that before jumping into the repair aspect of these pieces that I would write a bit about their history. 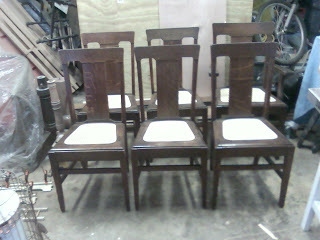 for all of the time that I have been a cabinetmaker I have referred to these pieces as American Empire. Recently while researching another piece I came across this term of "Pillar and Scroll". The reason for this type of construction is that by the 1840's furniture manufacture had moved into a quasi mass production setting for the first time. 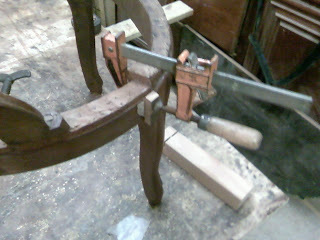 While the joinery was still done by hand, the sawing of the wood and veneers was starting to be done by with the help of machines. The curvilinear designs for these pieces utilised the band saw to cut the initial shapes out of a secondary wood, usually pine or poplar. These shapes were cut from large stacked blanks or assembled from hollow forms. 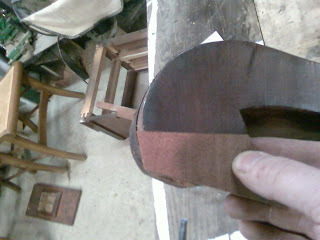 The shapes, once cut and sanded were veneered. 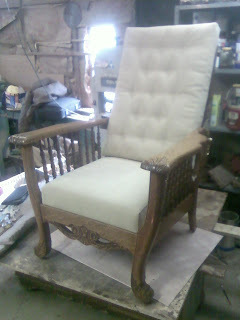 The result was decoration which was relatively easy to produce and repeat. It was also inexpensive to produce. Only in the higher end pieces do you find carving for ornamentation. Turnings were sometimes used as well for ornamentation but overall it was the simplified veneer decoration which dominated this style. While I use the term pillar and scroll the proper categorisation of these pieces would be Late Empire or Late Classical. I like the use of Pillar and Scroll because it properly identifies these pieces. This being said, these pieces have design elements taken from the American Empire movement in furniture and fall within this category. 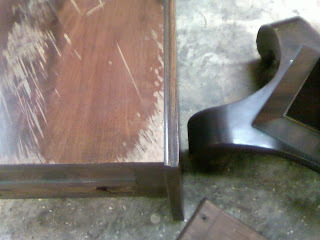 The drop leaf table as it came to me was severely damaged by movers and was disassembled and badly gouged on the top. 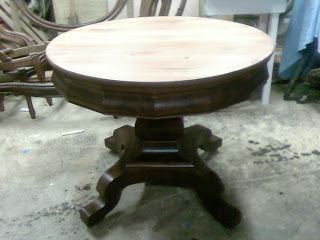 The Pedestal table was in better condition and but needed veneer work done as well as having he top refinished. 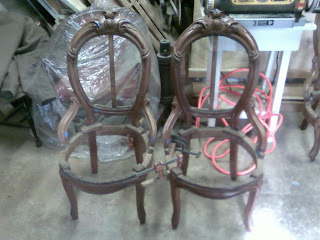 below are some photos of the pieces as they came to me I will follow this up by individual posts concerning the repairs. 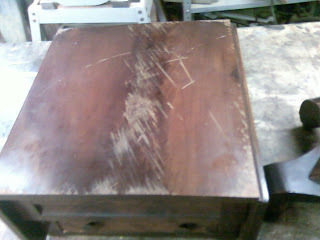 The drop leaf two drawer stand Damage to the top of the stand. A close up of the damage. 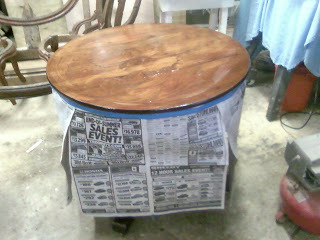 The Pedestal table. 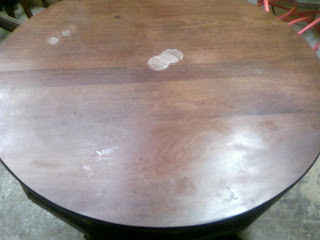 Damage to the top of the pedestal table. 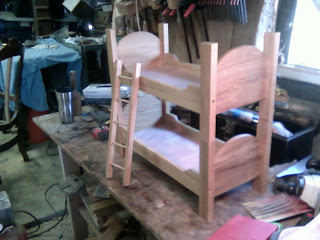 Here are a few pictures of the completion of the bunk beds. 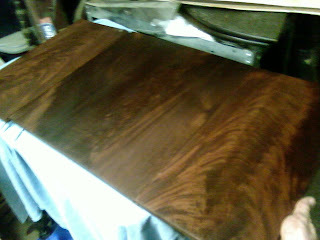 At the end of the post are a few photos of the beds with finish on them. 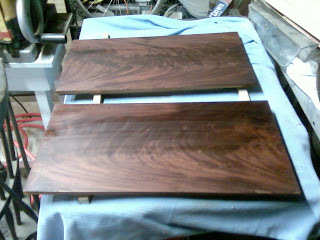 One advantage to using French Polish for a finish on children's toys is that it is the safest finish for children. In fact, the largest use of shellac in the world is for the food industry. 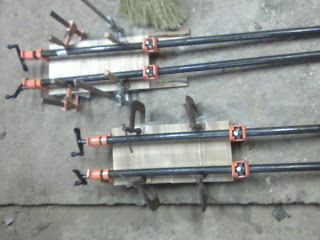 Gluing the bed supports on the side rails. 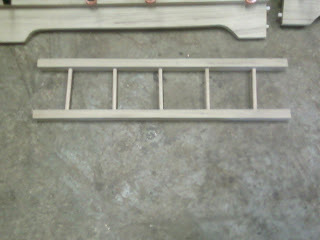 The Ladder gluing up. 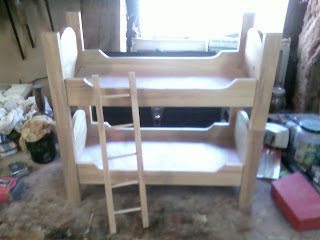 The beds completed ans sanded ready for finish. 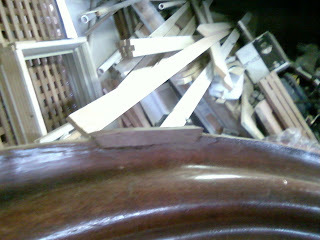 The bed disassembled during the finishing process. 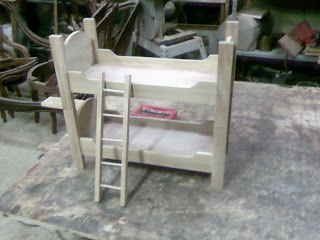 The completed beds. 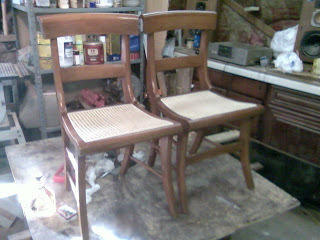 Here are a few pictures of the Crawford chairs reassembled and with the new cane in place. 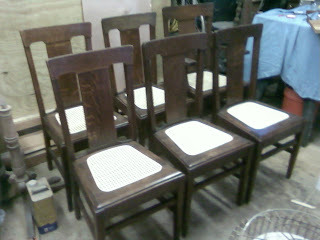 The seats will yellow overtime due to oxidation. 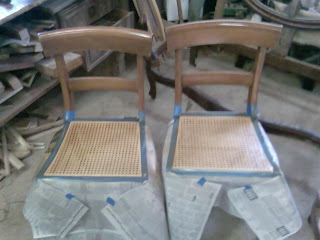 The nice thing about leaving cane seats natural versus staining them is that they last longer. About a month ago I sent an email to my customers to see if anyone was interested in custom objects like turnings or carvings for Christmas. 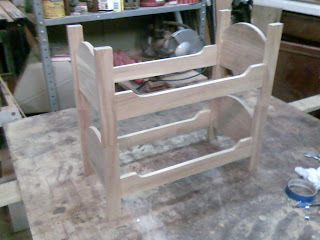 One of the responses was from a customer who wanted some bunk beds made for her daughters American Girl Doll. Below are some photos of the process of making the beds. 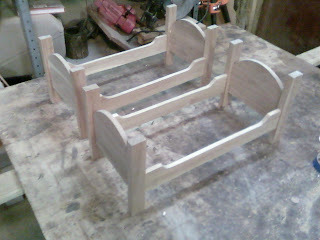 I decided to build them out of Locust which is a local hard wood.The inner measurements for the beds are roughly 8" x 18". I will post a second post when they are completed. 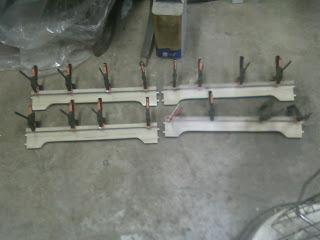 Here is a photo of the board I used for the parts before it was milled. 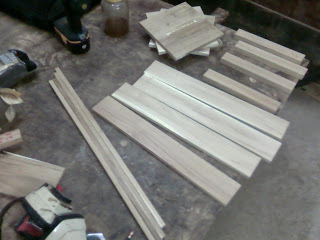 Gluing up the boards that will become the head board and foot board. 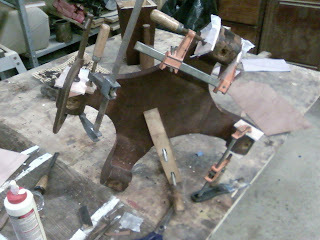 The various parts milled and cut to size. 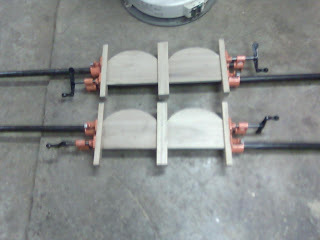 Gluing up the head boards and foot boards. 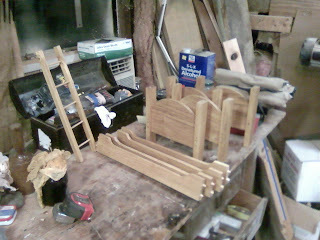 The frames for the beds assembled.Like real beds the rails will be detachable from the head and foot boards. The beds in bunk positions.